Google recently renamed their Google Apps for Work service as 'G Suite,' which I still think sounds silly. However, the features Google announced today for all G Suite users are anything but. Possibly the most important new feature is Action Items, which are Docs files assigned to a person or group of people. You can assign documents to others, which then appear on the recipient's main Drive screen with a special badge. Additionally, when you create a comment on the desktop site along the lines of "Phil to enter numbers for this week," Docs can figure out whom you are talking about and assign it to them automatically. Google sure loves Natural Language Processing. Assigning boring tasks has never been easier. Next up is Google Forms, which now analyzes questions you enter and tries to predict possible responses. Google estimates this will cut down on the amount of time creating forms by around 25%. Once you type out a question, a list of responses will appear under the text box, and you can click to enter some or all into the form. 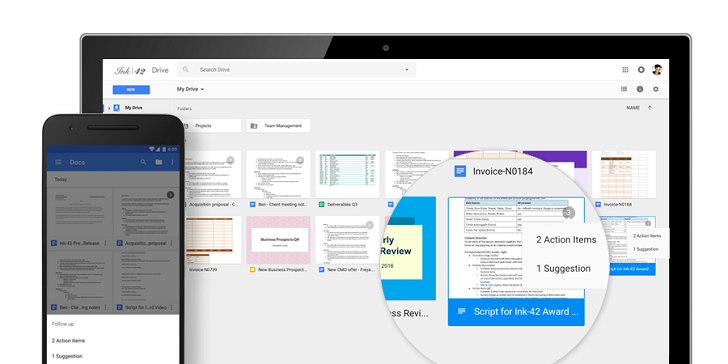 Additionally, G Suite customers can now add File Upload buttons into their forms, which are collected into a folder on Google Drive. If you prefer voice dictation over typing, Google has added more ways to insert formatting without touching a key. And finally, you can now create and share Docs files straight from Slack. Google's post indicates that Action items, the voice typing improvements, and Slack integration should be available immediately to all G Suite users. Suggested responses in Forms and suggested action items should arrive November 2, and File Uploads in Forms are slated for November 9. Voice commands is currently the only feature mentioned that will be available to normal Google accounts.